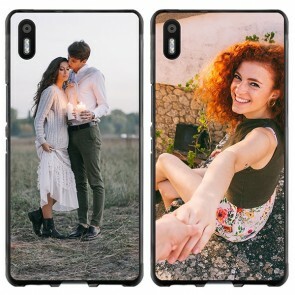 Are you looking for a unique phone cover that protects your phone adequately? No need to look any further! Here at GoCustomized, we have exactly what you need. With our user-friendly design tool, you can make your own BQ Aquaris X5 photo case. Your one-of-a-kind, custom BQ Aquaris X5 case will protect your cherished device from scratch, impact, and drop damages! Designing a custom case is quick, fun and easy! To start, upload your favorite picture onto the case. This can be your company logo, a picture of your cute cat, or your wedding photograph, for instance. You can then modify the image by applying a filter, resizing it, or changing its orientation. The next step is to add text to your custom BQ Aquaris X5 case. How about adding the name of a loved one, an important date, or even a funny quote? Let your creativity shine! Are you lacking inspiration? No problem, just take a look at our exciting pre-made designs! Once you have made a custom case that perfectly suits your tastes, our production team will print and ship it within 24 hours. Start now and make your own BQ Aquaris X5 photo case! Have you always wanted to create a unique, personal accessory? You can do this in a few simple and fun steps with GoCustomized! With our customizer, you can make your own BQ Aquaris X5 photo case! You can be sure that your cell phone will look like no other. On top of that, your custom BQ Aquaris X5 case will protect your device from any scratch, impact and drop damages! What more could one ask for? To start making your custom BQ Aquaris X5 case, upload your favorite photo, pattern, or design from your computer, phone or social media account into our design tool. This can be a picture of your children, your pets, or your company logo, for example! Next, add text, a sticker, or a filter to your custom case. Once you have created the perfect design, your case will be printed using high-quality UV printers and scratch resistant ink. It will be produced and shipped within 24 hours. What are you waiting for? Make your own BQ Aquaris X5 photo case today!